As temperatures drop and autumn moves steadily forward, we tend to think the growing season is over. Ah, but there are still a few forage-able crops for the adventurous eater and cook to make the most of. Sweet autumn olive (Eleagnus angustifolia) and spicebush (Lindera benzoin) are ripe and ready for picking right now. Both are widely available throughout the five boroughs. 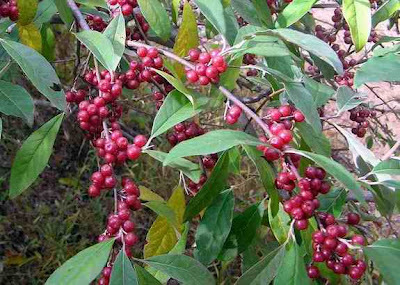 Sweet autumn olive (aka silverberry) is considered an invasive plant in many parts of the country. It fruits (and therefore seeds) prolifically, and lots of those seeds make it to the ground, hence its reproductive success. The fruit is about the size of a large blueberry, oval, and pinky-silver. A large-ish seed makes it a poor choice for a trail side snack, but the taste is tart and fresh and the color of the pulp is striking. I've used it for jelly and wine, but this year I wanted to try something different. which, to my mouth, have a taste that resembles allspice and nutmeg combined. Berries can be either frozen or dried, then ground in a spice grinder as needed. It's good with both sweet and savory and combines well with pears and apples, pork and chicken. I based my experiment on a persimmon bread recipe from Billy Joe Tatum's Wild Foods Fieldguide and Cookbook, modified to fit what I had on hand. -Cream 1 stick softened butter with 3/4 c. sugar and 1 egg. Set aside. -Combine 2 c. flour, 1 tsp. baking powder, 1 tsp. baking soda, 1/2 tsp. salt, and 1 & 1/2 tsp. ground spicebush berry, then blend dry ingredients into butter mixture. -Add 1 c. silverberry pulp (run the berries through a food mill w/a medium disc) and 1 tsp. vanilla and mix thoroughly. The batter will be stiff. -Spoon batter into a greased, 9 x 5 loaf pan and let it sit 20 minutes. -Bake at 375 F for 50 minutes or till a toothpick comes out clean. -Remove from pan and let cool on a rack. I think it's most delicious when lightly toasted and buttered: moist, spicy, and slightly sweet. P.S. Because silverberry is considered invasive in this area, picking the berries is actually a public service. Every berry you pick is one more seed that won't reach the ground. 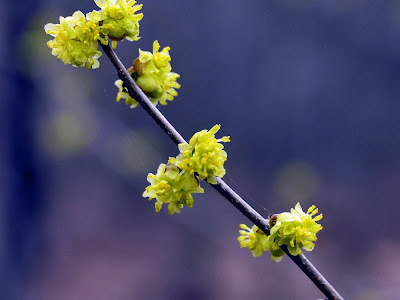 As for the spicebush berries, well I can't offer a similar rationalization, but if you feel funny foraging, you can order the spice from Integration Acres, under Appalachian Allspice. I think there are thousands of these along Ft. Tilden. What a beautiful loaf! And great tip about Integration Acres - I'll definitely order something from them, if I can stop dithering and decide.